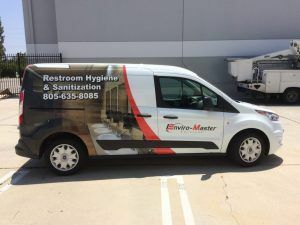 Partial vehicle wraps are a great option when it is not necessary to wrap the whole vehicle but you would like to have more than a few graphic images. Mobile advertising is a great way to get brand recognition. Having an eye-catching image along with your company services and the name is a great way to attract new customers. Both sides of the vehicle are identical – we wrapped a little more than half of each side with the image they provided and added a red stripe to transition between the part of the car that is wrapped and the half that is not. We also added their services and phone number on top of the image and added the company name to both front doors. It is important that the information contrasts well with the background so we used white font against the dark image. Their existing logo worked great against the already white paint of the car. We kept the front and back pretty simple. The front has the logo and company sign on the hood and we partially wrapped the top of the back of the car with red and added the company name, their services, and their phone number. 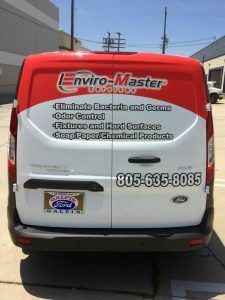 Everything that we installed onto the vehicle was digitally printed onto car wrap vinyl aside from anything covering the windows which are printed on perforated window vinyl. 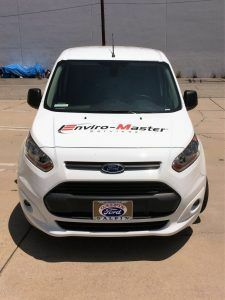 Perforated window vinyl is very important with full or partial vehicle wraps because it lets us use more area to advertise on while making sure the driver can still see through the windows. If we were unable to wrap the window, we wouldn’t have had enough room to include the services the company offers. Mobile advertising is becoming very popular among businesses and it is not unusual to see a car with at least some graphics one on your regular commute. With the rising popularity, you want to make sure that your vehicle stands out from the others. Partial wraps give us an opportunity to create an aesthetically pleasing, subtle design. Using our large format printer we can wrap your car with amazing graphics that help show what your business is all about. For example, a bakery could have an image of a cookie or a cupcake. This way the consumer knows right away that the business has to do with baked goods and will read more details if they are interested. We can do full wraps, partial wraps, graphics, and window graphics. If you are interested in beginning mobile advertising with your business, you can request a quote here.